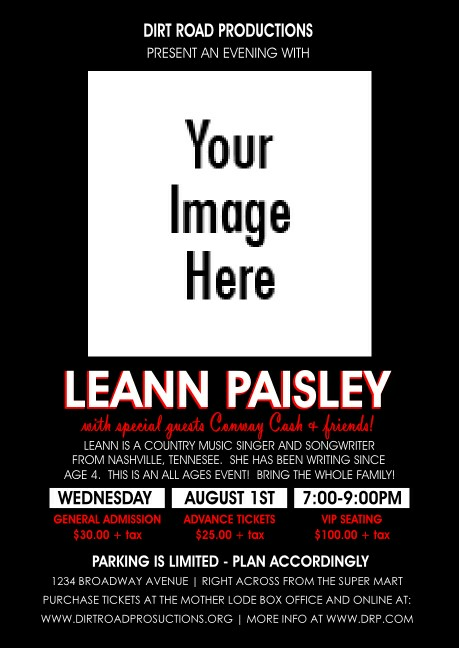 Content yourself and boost your event attendance when you advertise in advance with personalized Your Photo Concert Black and Red Postcards. These templates are designed to be customized with any image you want to feature in black and white, and include a solid black background with up to twenty lines of bright red and white text. Customize your promotions with TicketPrinting.com. *0.1 inch Cut Margin and a 0.1 inch Safety Margin on uploaded background images. Please note that you need to leave room for these in your images or it could be cut off.